I've just returned from two weeks in the UK, where they are still digesting the likely impacts of the coalition goverment's first budget. I'm not going to dig through it in any detail, but for those of you who are interested here is a pretty good synopsis, albeit one that reflects my predjudices. In a nutshell, the Conservatives and the Other Conservatives (as I think we can now call the Former Liberal Democratic Party) have chosen to go for an aggressive program of deficit reduction, fearing that the UK may be vulnerable to a Greekonomic financial collapse if they don't do so. As part of this scheme they are proposing one of the biggest reductions in the public sector that the UK has seen for decades - a 25% cut in departmental budgets over the next four years. I'm not one to say "I told you so" (even if I did) and in fairness I should point out that had Labour won they also would have imposed cuts, although their proposed schedule was nothing like as aggressive as that proposed by the Tories. But one can't help thinking that Osborne et al are relishing the prospect of swinging an axe at state funding, while being able to look sorry about it and talk about the need to tighten belts, etc. Since the earliest days of Thatcher the Conservatives have never liked the public sector believing, in the absence of all evidence to the contrary (e.g. the UK rail network), that the private sector does things better. What's the likely outcome for UK museums? We won't know until the Fall, but I'm going to make another surefire PoH prediction and say that it will probably not be good. Bear in mind that the proposed cuts to department's budgets will average 25% - some areas have already been ringfenced from cuts, notably international development and the National Health Service. Before those of you of a liberal bent get all excited about the former and start saying "oh well, they can't be all bad," bear in mind that overseas aid is a tiny portion of the UK budget. Protecting it from cuts allows Cameron to behave sanctimoniously at the G20 and is a small figleaf on top of a massive mountain. The effects of protecting the NHS will be much more widely felt and if (as seems likely) the government is forced to backtrack on proposed cuts in defense, education, and policing, then the remaining cuts are going to fall very heavily on departments like the Museums and Libraries Commission and the scientific research funds admininstered by the Department for Business, Innovation and Skills. Is there any good news? Well, if you want to volunteer in a museum, I'd say the omens are looking pretty good. One of the more bizarre ideas being kicked around by the Government is that trainee police officers should work without pay for their first year of training. If a Tory goverment is thinking about doing that to coppers, what do think the outlook will be for museum workers? Responding to a recent series of incidents in which a number of universities responding to financial crises by selling off (or attempting to sell off) their museum collections, the American Association of Museums has made a number of revisions to its Accreditation Program that are intending to emphasize the role, value, and use of the collections, and related museum ethics and standards. In the words of AAM, "the revised policy requires parent organizations--college/university, government, corporate foundation, state historical society operating multiple sites, etc.--of accredited museums to include language in a required statement of support which specifically prohibits museum collections from being considered as disposable assets." The changes have been welcomed by the Association of Academic Museums & Galleries and are undoubtably a good thing - as regular readers of this blog will be aware, the failure of institutions to face up to the responsibilities associated with collections stewardship is a regular source of irritation to me - they are not just "another asset" and you would have to be an idiot to think otherwise. However, I can't help thinking that the sort of institution that would sell off all or part of its collections is unlikely to bother itself overmuch about whether its collections were accredited in the first place. Anyone who's interested in the challenges facing museums over the next few decades should go take a look at Demographic Transformation and the Future of Museums, an excellent report produced by Betty Ferrell and Maria Medvedeva and published by AAM's Center for the Future of Museums. If you want to understand, in a nutshell, just how big these challenges are, take a look at the graph that I've reproduced here. What it shows is that our core visitor population reflects the demographics of the USA more than 40 years ago, rather than the situation today. Those three and a half little purple people are a measure of our declining relevance to the public that pays our bills. It should be a clarion call to action. Why is this important to those of us that work in collections? Well, one reason is that visting a museum is one way in which many of us start out on museum careers. It's vital that we are both welcoming and inspiring towards people of all races and ethnicities because, frankly, we do not have a very diverse workforce in collections, nor do we seem to be making headway towards developing one. Another statistic that emerges from the report is that 80% of museum studies students are white and 80% are female. As the national population diversifies, this monocultural workforce is going to seriously limit our ability to incorporate different points of view. Not only does it make us look bad - it becomes a real problem as we try to tiptoe through the cultural minefield regarding issues such as repatriation. Fortunately, the report is not all doom and gloom. First of all (not that I want to be smug or anything) it's clear that natural history museums do a lot better at attracting diverse audiences than those that specialize in the arts and humanities. It's also apparent that many museums are already taking steps in the right direction; there are a bunch of really interesting case studies featured in the report, to which I would add Peabody's own EVOLUTIONS after school program. And the report concludes with a comprehensive call to action for museums that ought to inspire anyone from our profession that reads it. I urge you to do so. 1) A Walk Through Time. The layout of the gallery follows the progression of geological time. I am in the Carboniferous – here is a big dragonfly and a fern; I am in the Cretaceous – here is Triceratops, here is a flowering plant; etc. 2) A Climb Through the Tree of Life. The layout of the gallery reflects phylogenetics. This is typified by the fossil galleries of AMNH, a cathedral to cladistics complete with Stations of the Cross for the synapomorphies of each of the major vertebrate clades (Behold – Epitheria!). 3) What’s in My Backyard? The gallery is arranged according to regional geology, with examples of fossils from each of the major deposits. In planning the new fossil halls at the Peabody, one of the first questions that had to be considered is which, if any, of these approaches we’re going to adopt. Option 3 can be discarded fairly quickly as – with apologies to all of you passionate Connecticut fossil hounds – the prospect of a gallery featuring Triassic fish and some dinosaur footprints didn’t exactly set the heart pounding. A case on local fossils is one thing, but a whole gallery just won’t fly. A phylogenetics-based approach has a lot to commend it, especially given the research interests of our curatorial staff, but unfortunately we have a near neighbor in NYC who has already done this, and no-one can accuse us of being copycats. That leaves a Walk Through Time, which is more or less what the current galleries are. It’s certainly the theme of the two Zallinger murals, which form a great procession of life spanning 400 million years from the Devonian to the Pleistocene. This was the approach taken by all the “prehistoric life” books that I devoured as a kid and one that the public is familiar with. The problem is that it’s also a straightjacket. It makes it very easy to divide the history of life on earth up into little geological nuggets, each with its own set of bullet-pointed characters. It is the Pleistocene. There are ice ages. It is cold, except during interglacials, when it is warm. 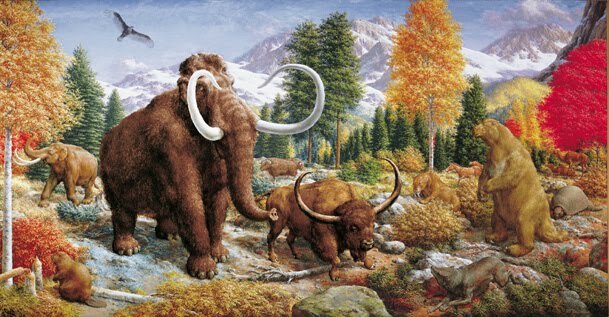 There are mammoths and sabertooth tigers. Then humans evolve and kill them all. That is the end of prehistory. Next, agriculture and pyramids. It’s easy to absorb factoids like this, but cutting things up into chunks dictated by the geological timescale tends to obscure long-term changes that take place over even greater timescales and also makes people think that there are neat divisions between one period and another. One of the nice things about Zallinger’s murals is that by and large they don’t fall into this trap. Stand back and take a look at the Age of Mammals, and you can see that the climate is changing, but by-and-large, the different environments blend smoothly into each other (with the exception of the river that, like some Paleo-Styx, divides Zallinger’s Oligocene parklands from the brown prairies of the Miocene). This is important, because the message that we’d like to get across through these displays is the dynamic nature of the Earth. The environment is constantly changing, driven by factors such as plate tectonics, mountain building, the movement of ocean currents, and the opening and closing of the oceans themselves. These changes are reflected in the evolution of the organisms living on the planet. It’s a much more fluid situation than the “ladder” of geological time suggests. This is why, in the end, it was decided to take a “fourth way” in designing the new halls. The layout of the galleries will reflect the changing environment. It’s an attractive option for us, in that much of the research work undertaken by Peabody’s departmental partners over the last decade or so has emphasized interdisciplinary approaches, which have combined environmental sciences, evolutionary biology, and earth sciences. You can see this most vividly in the research programs of the Yale Institute for Biospheric Studies, to which many of the Peabody’s curatorial staff contribute. By now, some of you are probably asking, how does this differ from a Walk Through Time, in that they are both progressive and have a time axis. The differences are, I will admit, subtle ones, and the best way to explain them will be to look in detail at the planning process for one of the galleries, the Fossil Mammal Hall. Which we’ll do in a future post. Can sustainability make you sick? If you work in a LEED-certified building, the answer may be 'yes.' On May 25th, Environment and Human Health, Inc. (EHHI), a non-profit organization composed of doctors, public health professionals, and policy experts who specialize in research that examines environmental threats to human health, released a report entitled “LEED Certification: Where Energy Efficiency Collides With Human Health.” The gist of the report was that by taking steps to reduce the exchange of air between the building and the exterior in pursuit of energy efficiency, LEED-certified buildings can concentrate chemicals released from building materials, cleaning supplies, fuel combustion, pesticides and other hazardous substances. 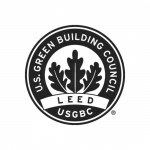 Pedictably this led to a robust response from the U.S. Green Building Council, which believes that it is LEED buildings, rather than the LEED standards themselves, that need to be improved. Expect this one to run and run. For museums, and particularly museum collections, this is a critical issue. Museum collection facilities are energy hogs - in pursuit of a stable environment for our specimens, we set stringent requirements for HVAC. Running counter to this is a feeling that museums, and in particular natural history museums, should be taking a lead in responsible use of resources. Most of the ongoing debate in our sector at the moment is focussing on whether we can afford to relax some of the existing environmental standards for specimen conservation. But we may be missing a bigger issue. Our collections, some of which have specimens with high levels of residual pesticides, or are preserved or prepared with noxious fluids, or which may emit radon and other naturally occurring radioactivity, present a variety of human health risks. Sustainability is a good thing, but we can't afford to achieve it at the cost of the health of our visitors and workers. Of course, there have been many changes at the Peabody over the last few decades but, rightly or wrongly, most people’s perception of the Museum is shaped by the Great Hall. And, truth be told, it hasn’t changed much. Take a look at the image that I’ve posted with the blog and tell me what decade it comes from – 80s, 90s, or 00s? If you answered 00s you’d be wrong. Actually you’d be wrong on all three counts, because the photo was taken in the 1970s. 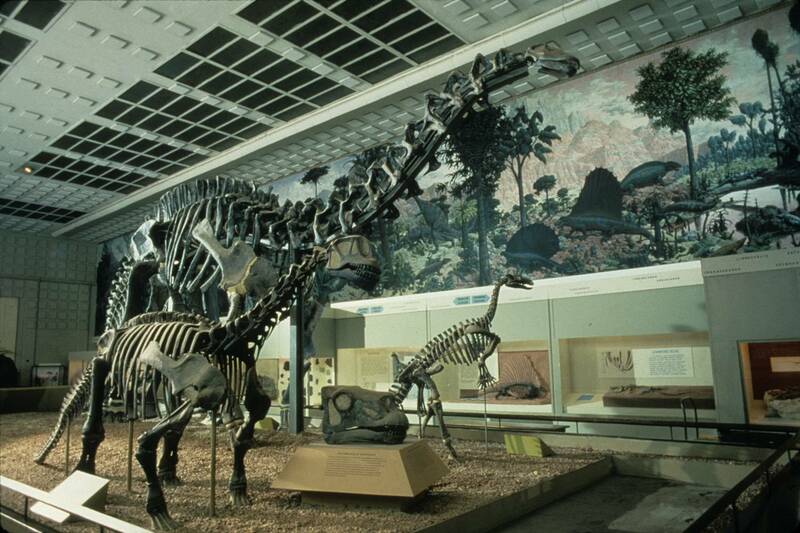 While other museums like AMNH, Carnegie, the ROM, and Denver have all launched new fossil exhibits, Yale’s displays have remained genteelly anchored in the 1950s. This is a pity, because Yale was one of the leaders in displaying fossil material. Back in 1925, when the Great Hall was opened, it represented the cutting edge for museum displays. Paleontology, both at Yale and in the wider world, has come a long way since then, but sadly our displays have failed to keep up. Fortunately, help is at hand. The cog wheels of a great university move slowly, especially in a time of recession, but we were recently told that Yale was prepared to make funding available to help us plan how we might go about reimagining the Great Hall and the adjacent fossil mammal gallery for the 21st Century. Money to plan a new display is obviously not the same as money for a new display, but nonetheless it’s an important first step and we’re all very excited. There are some significant challenges, not the least of which is how we work with two very large “elephants” in the room, namely the magnificent Zallinger Murals “The Age of Reptiles” and “The Age of Mammals” that are fixtures in the galleries. Anything that we do has to incorporate these murals, which are great art, but woefully outdated scientifically. We also have to work out how to display more specimens, notably from the Peabody’s matchless collections of fossil invertebrates and plants, together with specimens from Princeton’s vertebrate paleontology collections that were acquired by Yale in the mid 1980s but which have never been displayed, all within the existing, limited gallery space. Plus, we also want to give Peabody’s galleries a new slant – a perspective on evolution and earth history that hasn’t been tried before. One of the nice things about writing a blog is that I will be able to share some of this process with you over the next year. It’s going to absorb a lot of my time, but fear not; if it looks like it’s displacing my usual high-quality posts – e.g. those disparaging cryptozoologists and pouring scorn on feckless curatorial staff and faculty – I’ll spin it off as a new blog. And make some other guy write it. PS: I give you advance warning that this is going to be a lousy month for updates, what with last week’s SPNHC meeting and two weeks’ vacation in the UK coming up, but I will do my best.